That's basically the question. I'm saving my pennies for a recumbent. New or secondhand I'm not sure which. I need good touring capability so 4 panniers plus. I'm quite tall but not heavy for my size. I'm guessing racks, guards, mirrors, somewhere to mount computer and lights. What else? How much does it all add up for reasonable quality secondhand and new? How much should I save up before I start looking seriously? Are you looking for two wheels or three? I bought a new KMX Cobra + mudguards, rack =£1338 then went on to spend another £350 on extras. Your question is how long is a piece of string to some the sky in the limit. And, for a trek in the other direction, this nice Grasshopper could have been yours for £1100 or so - would need lights + underseat rack for the extra panniers, but personally I would use a rack bag, panniers and banana bags to load up. About 2000 - 2500 and then upward new I'd say as a starting point. 800 to 1500 second hand, depending upon spec and age you could pay more. Also don't forget if you buy second hand you may need a consumables budget for tyres chains etc. As no one replaces them on something they are going to sell. EBay is a good source of what you can expect to pay second hand. Bikefix has a configurator for HP Velotechnik machines(these tend to be on the high side as they are over spec machines), challenge and Azub(Origami only). .
Laidback has prices for Bacchetta and Nazca. D-Tek Kevin is great to talk to and his half day try out sessions are superb if you don't know what you want. Secondhand it is then. £2000-2500 for new, is that with all you really need for touring? Banana bags cost a lot and hang from the seat so don't need mid rack I think. Radical do them don't they for a couple of hundred IIRC. Yes, HPV are pretty competitive when you look at the options and they are well engineered with good customer service. For example, Azub and Stein Trikes used to be cheaper but they aren't anymore. Tangled Metal wrote: Secondhand it is then. £2000-2500 for new, is that with all you really need for touring? 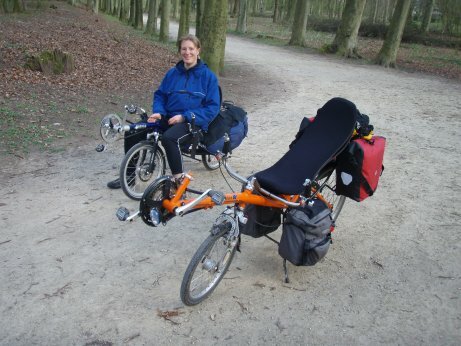 IF you only selected Racks on a Street machine as the only extra then the total cost would be 2400 , If you want banana/ moonbags you bust the budget, a different recumbent might work out better. Dependent on the recumbent you don't need banana bags . 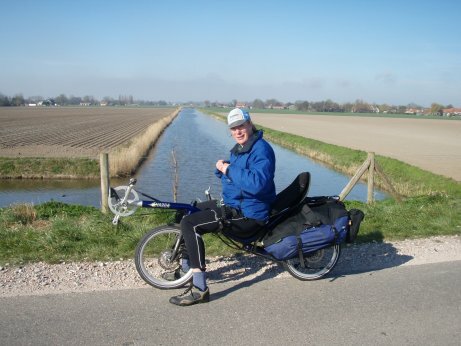 for instance on my Grasshopper I can use four panniers 2 large and 2 small( under seat). It not quite as aero as banana bags. Another way of Configuring this is to use the medium banana bags don't need a rack. I would say if you can find what you want second hand makes sense, many recumbents Don't have hard lives, but what you want can take a while to find. It took me about 6 months to find a Grasshopper, I had almost given up and decided to buy something else when Kevin got one in. Last edited by NUKe on 15 Jan 2018, 4:40pm, edited 1 time in total. My wife's Nazca Fiero Tour has a good rear rack but no lowrider rack, so she uses Radical banana bags for loaded touring. My Streetmachine GT has rear and lowrider racks, and takes 4 panniers. The banana bags certainly look better (the Fiero is a good looking bike IMHO, but actually looks better with the bags on) and spread the load well as they hang off the seat as well as the rack (you can use them with a seat only, but I think they work better with at least some rack to rest against). On the downside, they're a bit of a faff on and off so in practice they're left on the bike empty while mine go on and off at stops. Also, they don't underload very gracefully compared to "normal" panniers so while they're great if you need a lot of space, they're not so good if you only want a little (on a day trip, say). So I'd suggest banana bags if you can't use a lowrider rack, but stick to normal panniers (which I guess you may well have anyway) if you can add a lowrider. The lowrider rack on a Streetmachine is very good as it's sited so if you put heavy stuff in the lowriders the only effect on handling is gluing you to the road better. if you're used to fork-mounted lowriders on a traditional tourer I'd be very surprised if you're not favourably impressed with the difference. The Grasshopper has things a bit further back to account for being a little lower so not such an ideal position, but it still seems to work well enough. I like the look of the Fiero. I might try putting a 20" wheel on the rear of my Paseo (and alter the suspension anchor point to adjust the headtube angle). I'm finding it quite a stretch to get my leg over the Paseo. Seen the streetmachine GT for £500ish linked to earlier. It's the old design using cromoly instead of aluminium alloy in the current GTe model. It's about 2.5 hours drive each way to take a look. What's your views on it from the post that's linked to? Worth a first recumbent punt? I assume I can buy a lowrider rack for it, are such racks make/model specific? Tangled Metal wrote: I assume I can buy a lowrider rack for it, are such racks make/model specific? Underseat steering may or may not be to your taste. Another reason to try before you buy.